Highlights from today’s walk in O’Melveny Park included a large hawk showing lots of barring on the underwings and tail, white translucent wing windows, dark primary tips and a dark body. Since some folks did not see the dark patagial markings or a belly band, there was speculation that our bird was something more exotic than a Red-tailed Hawk. 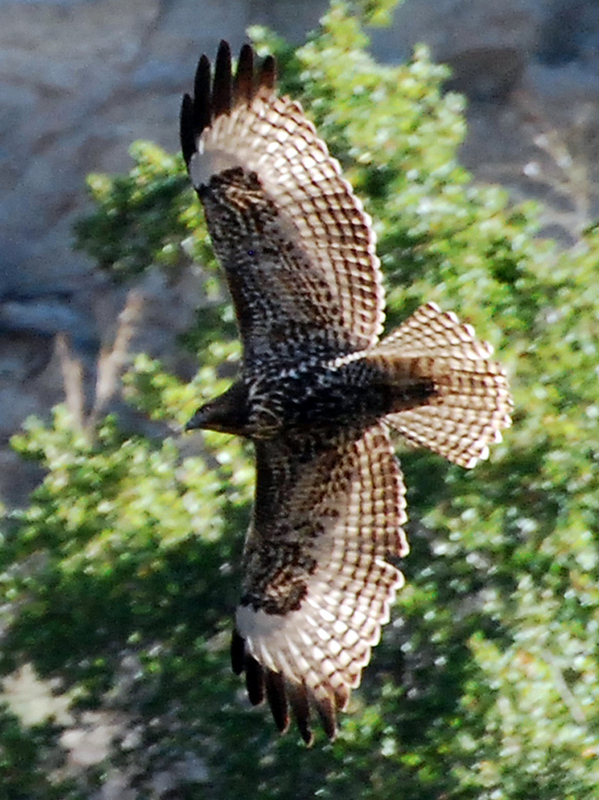 Fortunately, Karen Piorek got some very nice shots allowing us to confirm that it was a juvenile intermediate-morph Western Red-tailed Hawk, a plumage we don’t often see in the San Fernando Valley. We also had a distant look at a Northern Flicker showing yellow shafts in the wings and tail. Plumage detail on the head was too difficult to discern, so the bird goes down as an intergrade. Nice views were also had of California Thrasher and two Red-breasted Sapsuckers. The complete list follows. Notes: SFVAS; 11 observers, 16 Nov 2010, 9:00AM-11:30AM, clear, 68-75 deg F, calm wind, 0-1 mph. Leader: Jim Hardesty. 1 individual an intermediate-morph juvenile B.j.calurus. Photos. Distant view but yellow shafts on wing and tail visible. Face and nape markings not clear in distant view.